Barbados is an island nation in the Lesser Antilles, not far from Saint Vincent and the Grenadines, Trinidad and Tobago, and the Windward Islands. The capital and largest city of Barbados is Bridgetown. The current official flag of Barbados was adopted on November 30, 1966. The flag consists of 3 vertical bands of blue, yellow and blue color with a black color Trident in centre. Barbados is an island in the Lesser Antilles of the Caribbean Sea, whose history dates back to around the 4th century, when natives from the nearby continent of South America settled on the island. Around 800 AD, the Arawak people arrived from South America, followed by a tribe from what is now Venezuela, called the Carib or Kalinago around the 13th century. The latter people are those who gave their name to the region of the Caribbean, and who took over the island soon after they arrived. European explorers began arriving in the 16th century, beginning with the Portuguese and Spanish. The nation's name was probably bestowed upon the island by the Portuguese, who referred to the native trees (or possibly its people) as Los Barbados, “the Bearded Ones.” The Portuguese and Spanish explorers were followed by the English, who arrived in 1627. The English, unlike the Portuguese and Spanish, established a colony on Barbados, and governed the island until 1966. The English used the island as a base for trade, transporting slaves to the island to cultivate crops, like sugar cane. Barbados was part of the West Indies Federation for several years before the people of Barbados worked toward independence from Britain, succeeding in 1966. As an island, Barbados does not share borders with any other country. However, nearby nations include Trinidad and Tobago, Saint Vincent and the Grenadines, and the rest of the Windward Islands, Dominica, Martinique, Saint Lucia, and Grenada. 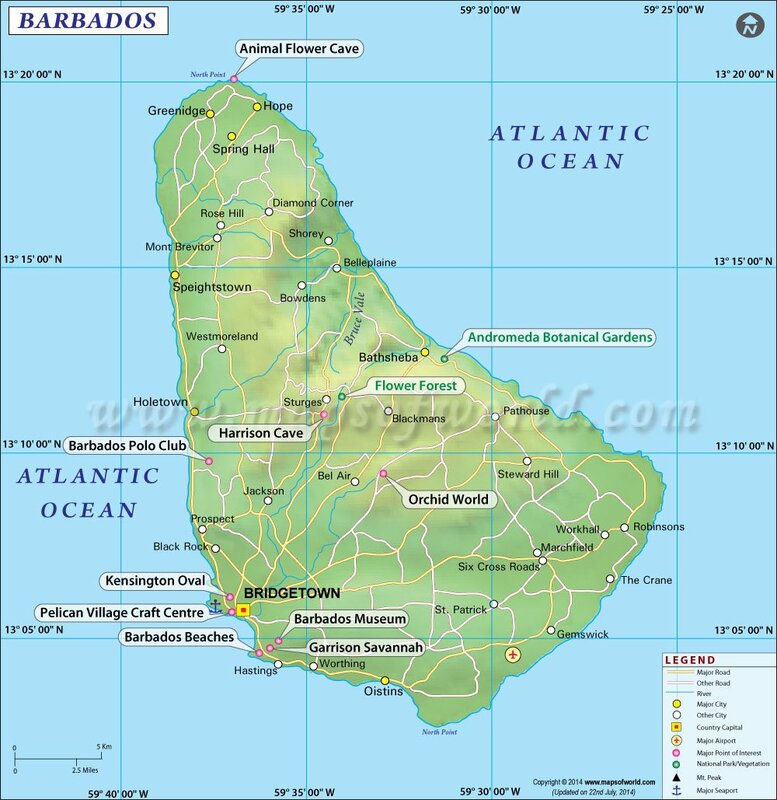 Barbados is a small island with an area of 431 square kilometers (166 square miles). The island extends 34 kilometers (21 miles) in length, and at its widest point, 23 kilometers (14 miles) in width. Much of the island's natural beauty lies in its coastlines and beaches. The terrain of the island features lowlands and rolling hills, and the highest point on the island located in its interior with Mount Hillaby, standing just 340 meters (1115 feet) above sea level. Much of the island is covered in limestone, and about 80% of the island's limestone region is used for sugarcane plantations. Barbados has a few small rivers which include the Constitution River, Bruce Vale River, Joes River, Long Pond River and Indian River. The longest one is the Constitution River, which is also has a harbor for small and medium-sized yachts. The majority of visitors to Barbados come for the beaches, staying in one of the many resorts along the coast. The coast and the waters provide plenty of entertainment options, from surfing and windsurfing to submarine rides, cruises, and scuba diving. The city of Bridgetown is the largest city of Barbados, and has a city center, offering a museum and government buildings, churches, and some notable historic architecture. Bridgetown's Sir Grantley Adams International Airport is the most common and convenient way to enter Barbados. The other option is to arrive by boat, particularly the cruise ships that usually arrive in Bridgetown. To get around the island, options include utilizing the bus system to get to the major areas, or renting a car or scooter to get to the more remote and less traveled areas. Potential drivers should note that traffic drives on the left side in Barbados, and that the roads are not in the best condition and can be dangerous. Taxis are another good option, as the costs are fairly inexpensive and the drives are typically safe.